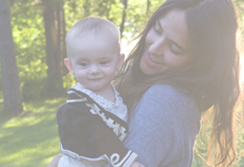 there are definitly things that i miss being pregnant, but i think the one thing that i really-really miss on a daily basis, are my morning. they used to be filled with runny yokes, sweet potatoe hash, bacon, did i say runny yokes? uh. i love me some runny yoke eggs…but for now, the site/smell of eggs sends me running for the porcelain. 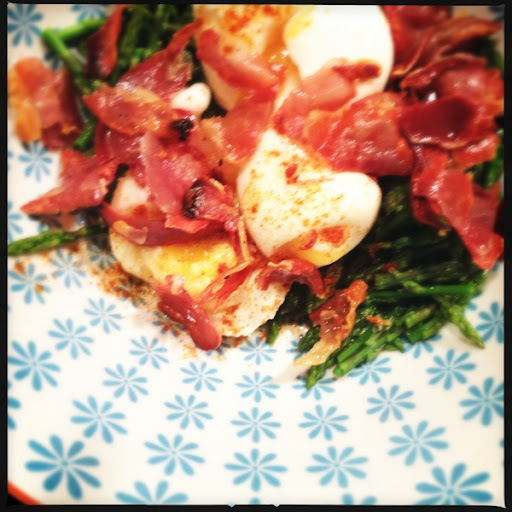 on that note…some of my favorite runny yoke egg recipes that i hope to one day enjoy again. 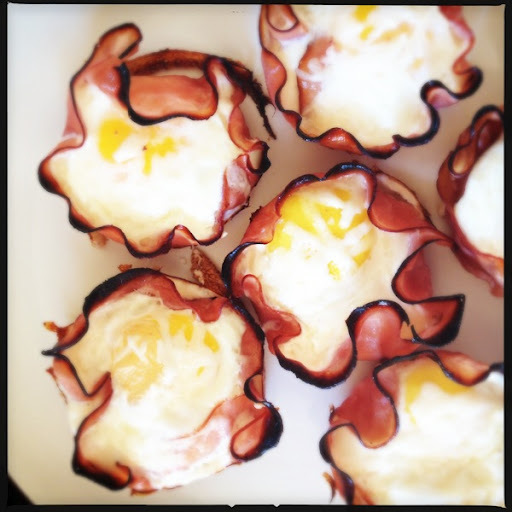 directions: preheat oven to 370 degrees, line greased cupcake tins with strips of proscuitto (it is much easier to remove the cups if the proscuitto completely lines the cups), crack egg into cups, sprinkle each egg with a little shredded cheese and dash of salt and pepper. Bake for 15 minutes, let sit for 5 min. for sweet potatote hash- peel 1-2 large sweet potatoes, with food processor ‘hasher’ shred potatoes. i fry my sweet potatoes in ghee, and add a hint of maple syrup. MMmMMmMm. 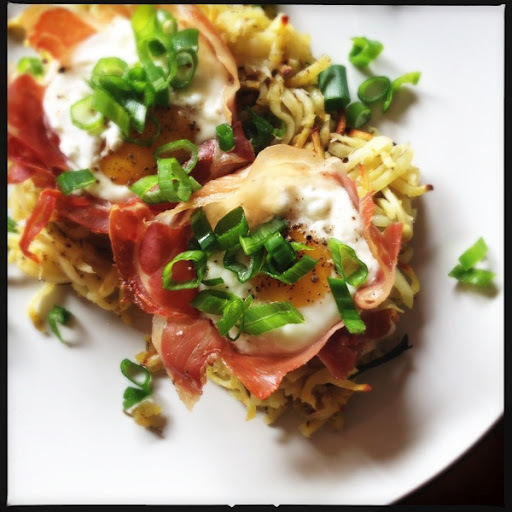 you can also make the hashbrowns in the oven if you are making large quantities. once egg cups have set, remove from tin, and place ontop of has brown, top with green onions. this is a somewhat simplified version of the first recipe! directions: preheat oven to 375 degrees- insert thin slices of ham into the cups of a greased (coconut oil, ghee) cupcake pan. crack egg into each cup. sprinkle with salt, pepper to taste. for the ham cups, i really prefer topping with gouda cheese. the two seem to pair really well. bake for 15 minutes, or until eggs set. if you want to get crazy, before cracking the egg, drizzle the ham with a little maple syrup. i know i’m weird, but i love egg yoke and maple syrup mixed together. This one takes a bit more effort, but is SO worth it. 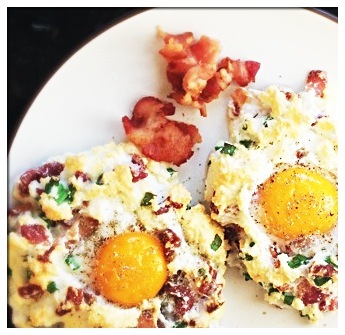 whip egg whites until peaks form – fold in bacon crumbles, shredded cheese, and green onion (or chives). divide the egg white mixture into the number of eggs used and spoon mounds onto a parchment lined baking sheet, create a deep well in the center of each mount. bake for 3 minutes. remove from oven, gently add 1 yoke into the well of each cloud. season with salt and pepper. bake for addition 2-3 minutes. layer- asparagus, egg (with salt and pepper), crisps. yes, yes, yes! gonna try lots. we will eat for you! god, i didn't know you were off eggs too. when will the nausea end? !